Forty-five years after he introduced the original Ford Mustang, launched at a dramatic press conference at the 1964 New York World's Fair, auto industry visionary Lee Iacocca today announced a new version of the famous muscle car – the Iacocca Silver 45th Anniversary Edition Ford Mustang. 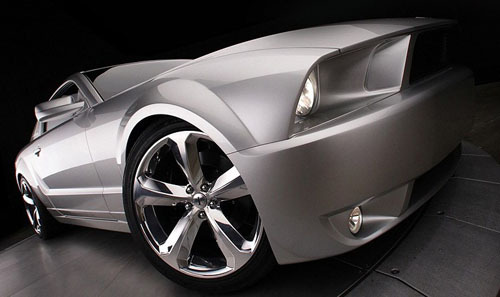 Only 45 "2009½" Iacocca Silver Edition Mustangs – all painted a special "Iacocca" chosen silver hue – will be built by Gaffoglio Family Metalcrafters. 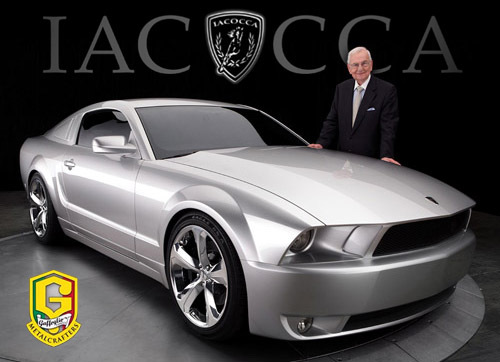 Nearly two years in the making, the Iacocca Silver Edition Mustang is a collaborative effort by Iacocca, designer Michael Leone, and Gaffoglio Family Metalcrafters. Like many newborn companies who want to be trendy and modern, the new business venture has been given the i-name: "I Legacy ". Only here the "I" stands for Iacocca, of course. "Legacy" fits another trend: honoring the past. The car begins life on a 2009 Mustang platform, which is modified and coachbuilt by Gaffoglio. Gaffoglio Metalcrafters was founded in 1979 by John Gaffoglio, who was born and raised in Argentina. He diligently practiced the art of metal crafting by hand and later taught his eldest sons, George and Ruben, how to master this art. He then decided to bring their talent to America. Today, Metalcrafters is known for manufacturing (non-streetlegal) prototype vehicles and concept cars for car manufacturers from all over the world like General Motors, Bentley, BMW, Hyundai, Mitsubishi, Chip Foose, Toyota, Lexus, Ford, Volkswagen and many more. Lee Iacocca's Mustang is their first streetlegal coachbuilt car. "Once in a while a car comes along that changes everything, and that was the original Mustang," said Iacocca. According to the press release, Lee's Silver Edition Mustang is meant to perpetuate the Iacocca mystique. However... this Mustang is not likely to change everything, because it is 'just' a full body facelift and not a radically restyled version of the current works Mustang. The original Mustang unleashed a revolution, Lee's current version on the other hand is an optical evolution of a car that also is an evolution of the original. Two power plant options will be offered, a normally-aspirated 4.6-liter Ford V8 rated at 320 horsepower and an optional supercharged version that delivers 400 horsepower. Drivers will harness the power through a 5-speed manual transmission. A Ford Racing Handling Package adds firmer springs and re-valved shock absorbers and a 14-inch Ford Racing Braking Package is optional. 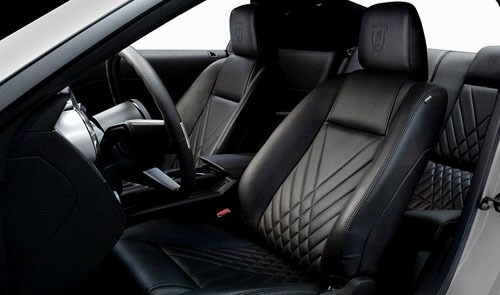 Inside the Iacocca Silver Mustang, the interior is restyled with Iacocca Diamond Design leather seats with embroidery stitching, an Iacocca signature dash plaque with serial number, a leather-wrapped steering wheel with "I" badge, and Iacocca-badged aluminum door sill plates. The cars will initially be revealed and then available at a reception in late July, at Southern California's Galpin Ford dealership. The price is yet to be announced.